If there’s one feature Stan users have been crying out for since the launch of the streaming service, it’s the ability to watch and browse its content from their gaming consoles. 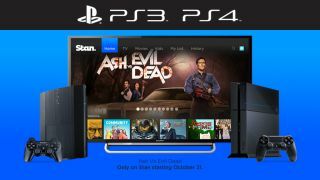 Now, Stan has taken an enormous step in the right direction, announcing a partnership with Sony Computer Entertainment Australia that will see a native Stan app arrive on PlayStation 3 and PlayStation 4 consoles on October 8. Existing Stan subscribers will be able to simply login to Stan’s PS3 and PS4 apps while new users will have to visit Stan’s site to sign up for a 30-day free trial. The announcement comes just in time for the release of Stan’s first original series, No Activity, the highly-anticipated October 31 premiere of the cult horror-comedy series, Ash vs. Evil Dead, and the entire series of Friends, which was added to the service late last month. To celebrate the momentous occasion, Stan and PlayStation have also announced that any customer who spends $30 or more on a PlayStation product at participating retailers, including JB HiFi, Target, Big W, EB Games and the PlayStation store, will receive a bonus one-off three-month subscription to Stan. Though Stan’s PlayStation apps are set to arrive tomorrow, there is currently no word on when the service will arrive on Xbox consoles, Wii U or smart TVs.